Help, The Ceiling Has Fallen! “Janice, hurry up. This is a catastrophe!” My scream pierced the early morning air. 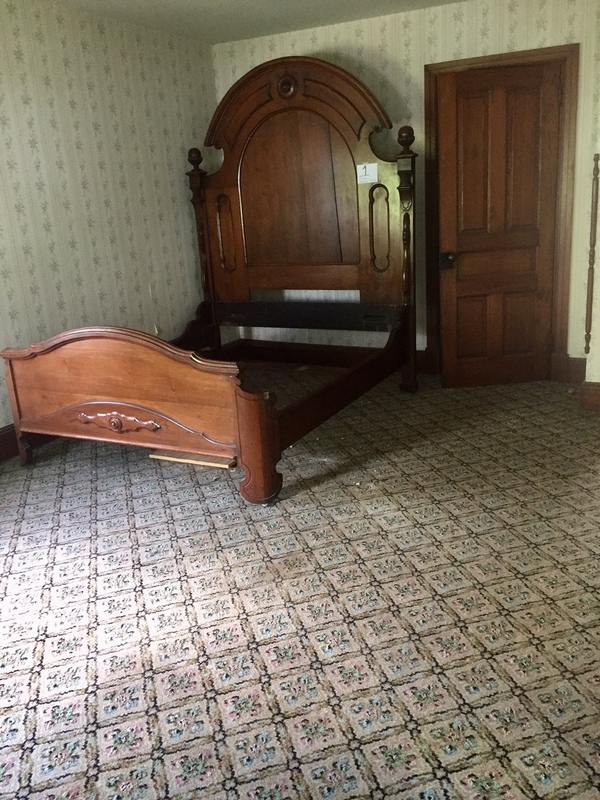 I had bounded up the stairs shortly after 7:00 a.m. to check the bedrooms before the Ruth Longenecker property sale. Prospective buyers were already milling through our aunt’s house from cellar to attic, inspecting the house and its contents. Opening the door to Grandma’s bedroom, to my consternation I found this, a heap of debris. My husband Cliff was not far behind, summoned by my shrieks. And Jan’s husband also rushed to the scene. What greeted us was a pile of broken plaster with attached wallpaper that had apparently hung on for dear life during its crazy ride from ceiling to floor. My sister and our husbands gaped in disbelief. Then the four of us got to work. A rainstorm from the night before evidently had loosened the lathe attached to the ceiling. The consequences were plain to see. How could such a thing have happened? Yes, there was a bulge in the ceiling, but the slate roof had been repaired. We didn’t expect this! The truth hit us like a ton of bricks. On a day when we wanted to put our best foot forward, the sky had fallen in, not in a Chicken Little sort of way, but more like a dizzy ballerina performing with mud on her tutu. Hours later after the mess was cleared and the sale underway, I caught up with Aunt Ruthie’s neighbor Anna Martha, whom I had known from childhood. 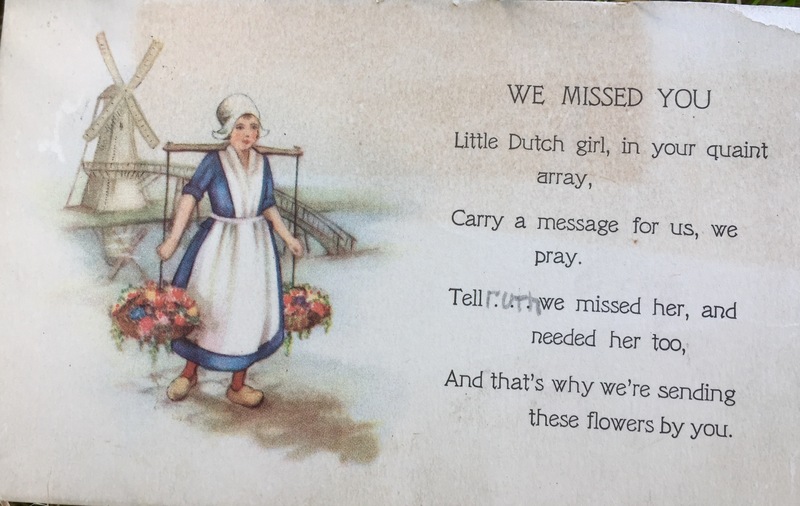 A few weeks earlier I had found a postcard her brother John (now deceased) had sent to Aunt Ruthie when he was a child. I intended to surprise Anna Martha with the card. 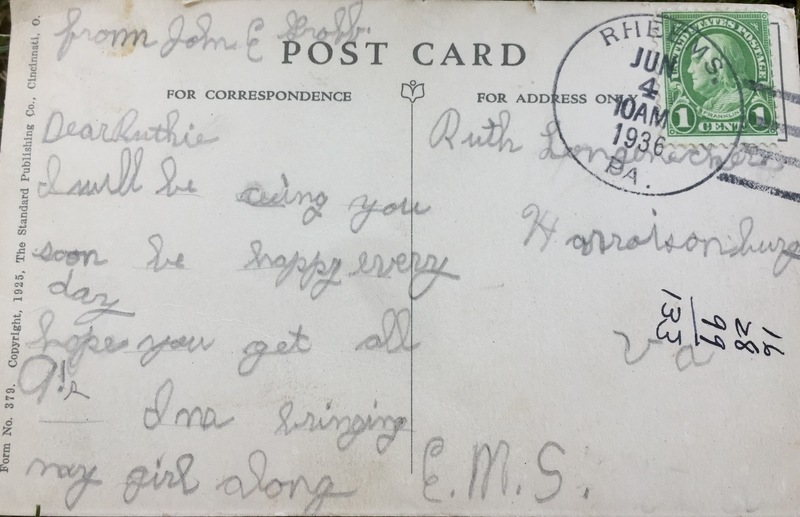 John Groff, an elementary school student at the time, wrote this message to his neighbor, my Aunt Ruthie, when she attended college at Eastern Mennonite School in Harrisonburg, Virginia, June 4, 1936. 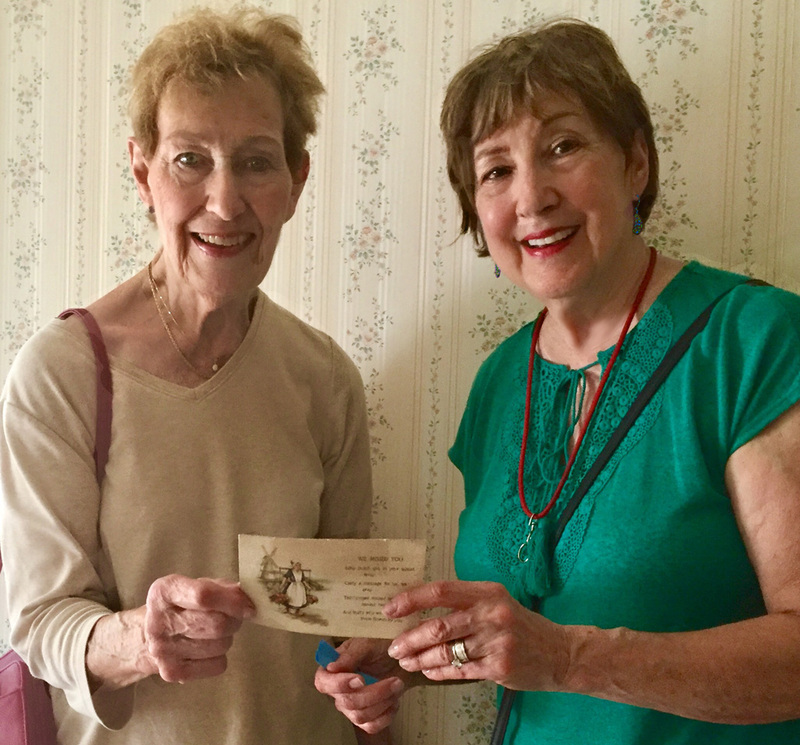 I looked and looked for Anna Martha, so I could present her the card from long ago. Where did I find her? In Grandma’s bedroom looking at the furniture, on the other side of the wall where the debris had lain hours earlier. 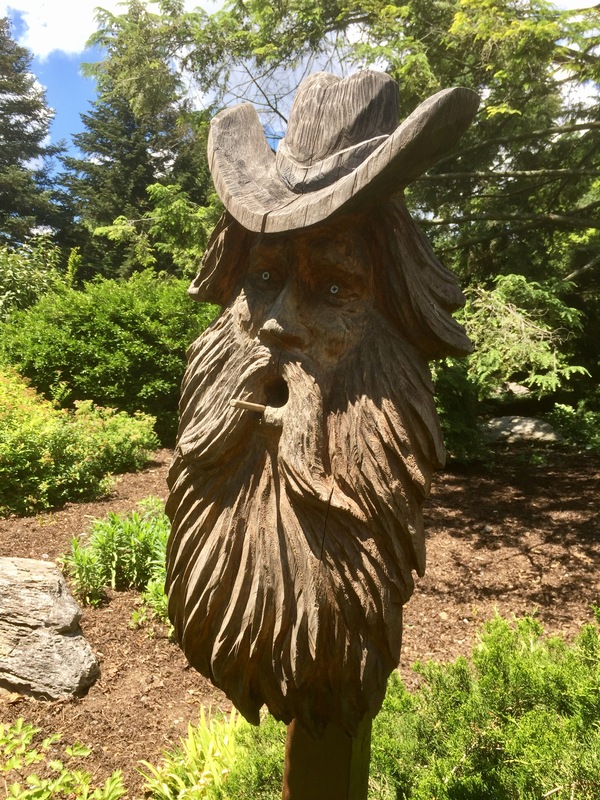 The next day, Sunday, we visited Hershey Gardens and spotted this wooden sculpture in the rose garden. A mountaineer. Right? But look again. Notice the long stick between the symmetry of the man’s handlebar moustache. Is it a pipe? Or something else? Squint so you can see the skinny rod protruding. It’s actually the perch for a bird house. It is true, isn’t it? Sometimes the snapshot of our lives visible to others does not match what is really going on behind the scenes. And sometimes what we do see is a false representation of reality. Viewpoint counts. It’s all in the perspective. Note: The buyers, a young couple, had toured the house weeks before the auction. On the day of the sale, they were out of the country, leading a class tour group. Enterprising and energetic, they probably viewed the collapsed ceiling as the first step in the restoration. Apparently so. They were not deterred from closing on the sale in late August. Has an upset in your life not been apparent to others? What other anecdotes come to mind from your (or other’s) experience? Can you think of a saying that matches my anecdote – or this theme? Winner of Lucinda Miller’s Book Giveaway will be announced next Wednesday, September 13. And it looks like I’m your early bird this morning. 🙂 But oh I bet your heart fell to your tummy in that moment. Glad the sale went through. Yes, I had many sensations including the heart-falling to my tummy. I do remember too feeling a surge of adrenalin that immediately followed. Congrats on being first in this column today, beginning the conversation. Thank you, Melodie. Good morning, Marian! There’s a lot to this post. I have to say that when I saw the title, I was afraid it was about your current home after the hurricane. I’m happy it was not, and that the problem with your Aunt Ruthie’s house was only the ceiling and not the roof, too. That house is beautiful! I love it. As far as things falling down when there are people around–I’ve mentioned before how our stove hood once fell down in the middle of a family holiday dinner, knocking the pot of soup onto the floor. Fortunately, we had already served it, so I only lost my leftovers. 🙂 But I was finding splatters of gold from the pumpkin-yellow split pea soup in spots around the kitchen for a while. Yes, I do remember reading about the stove hood plunging onto the holiday dinner table. Your family will always remember it – and never stop talking about it either. Ah! – tales that bind! That the perfect quote for today’s post. As you might guess, I save quotes so I may use this sometime. Thanks, Lynn. I can always count on you, Shirley, to provide insight and takeaway here. The quote is wonderful and fits with your theme of jubilacion too. On my morning walk, I thought of a post titled The Pleasures of an Uneventful Day. Maybe Week? Or Month? I know from the Granny Diaries you are enjoying the pleasures of slow strolls with Lydia. Just the thought calms the hurricane fatigue we in Florida are now experiencing. This summer I was involved in a re-do of Room 4 in the Education Building at church. On this day my husband, David, and I worked together, the only ones present in the whole complex. We were ready to replace aged covers for electrical outlets. One was quite sticky, and when my husband finally yanked, all the innards came out too, and, the room went dark. What had seemed so simple now felt suddenly complicated. Next door, in the bathroom, the light was out too. Where were the breakers in this church? A phone call to the pastor yielded the clue that some breakers were in the flower room. So we spent time reading through the breaker directory in the flower room…but no Room 4 was mentioned. The pastor had said other breakers were in a room used by Child Care, but no key did I have to those rooms. So the fix-es had to wait until we brought other people in to the situation. I gained a new appreciation for all the rooms in the church and all the breakers and that things are kept in good shape in spite of much complexity. Thank you for this ceiling story and the ancient post card. Love the way your family rallies and works together! The birdhouse man is priceless and illustrates your point so well! Made me smile! My sisters and I learned the rallying and working together long ago in the tomato field and sweet potato patch. As you know, it’s part of our heritage. Right now the Mennonite Disaster Service is probably aiding hurricane victim in Texas – and now Florida. I’m glad you enjoyed the post, Elfrieda. Congratulations on the sale of your aunt’s beautiful old home. I was nodding my head when I was reading, “Things are not always what they seem.” I think about that in my daily interactions with others and more so now that I am a writer…is the picture I present of myself genuine, or only a cover? “Trust me, Lucinda, you are genuine. But you are changing and growing too. That’s why you may feel conflicted,” says older sister Marian. Ha! Thanks for tuning in here and commenting. Thank you, Marian. You are right, and that’s good to hear. A silver lining in every cloud comes to mind. And hopefully all well in your neck of the woods after the storms. Yes, the drama did transform into something better. And we are glad to have the trauma of that morning behind us. I’m not sure what you mean by this: ” the addition, if that’s what it is, is incorrect?” Maybe you can clarify. Thank you for inquiring about the effects of Irma, Susan. Our house made it through unscathed but there was damage to the garage on a rental property when a pine tree fell on it full force. We count our blessings though and try to help those who lost much more. What a delightful house I’m sure who ever buys it will have much joy . We had a similar thing happen when we sold our house in the Midlands . We had people coming to view the very next day and a patch on the ceiling the size of a dinner plate fell on to the lounge carpet 😳 My husband Colin is a carpenter and fortunately picked up a few skills in plastering along the way . Nobody was any the wiser . I’m learning new Welsh (British) expressions with this post. I can guess what “gone for a burton” means. By the way, wasn’t Richard Burton Welsh? Marian — I love that your family is an “all hands on deck!” type of family. And I’m so glad the young couple wasn’t deterred from purchasing your aunt’s home. As therapist, I am sure you know full well the agony that sometimes hides behind those smiles. I’m glad you enjoyed the post as you cheer on the family with challenges this year. Thank you, Laurie! I am glad it was all right on the night, as they say, and tat the sale of the house went smoothly. We are currently in the process of selling our house in England and hope it will go withouto a hitch. I love that bird feeders too. I belive that people in general may look quite fit and healthy on the outside, but could be hurting deeply on the inside, just putting on a brave face. We are all good at doing that, don’t you think? I’m sending good thoughts for a solid buyer and easy sale process for your house in England. And, I agree, sometimes we paste on smiles to make ourselves feel better. And sometimes those smiles that feel fake bring on a more optimistic outlook – in the end. Aw,..what a special gift for Aunt Martha. When was the last time you received a post card, Marian? For me, it’s probably been twenty plus years, but then a couple of weeks ago, I received two in one week. I was so excited. I’m happy everything worked out well with Aunt Ruthie’s house and that your home didn’t sustain damage during Irma. 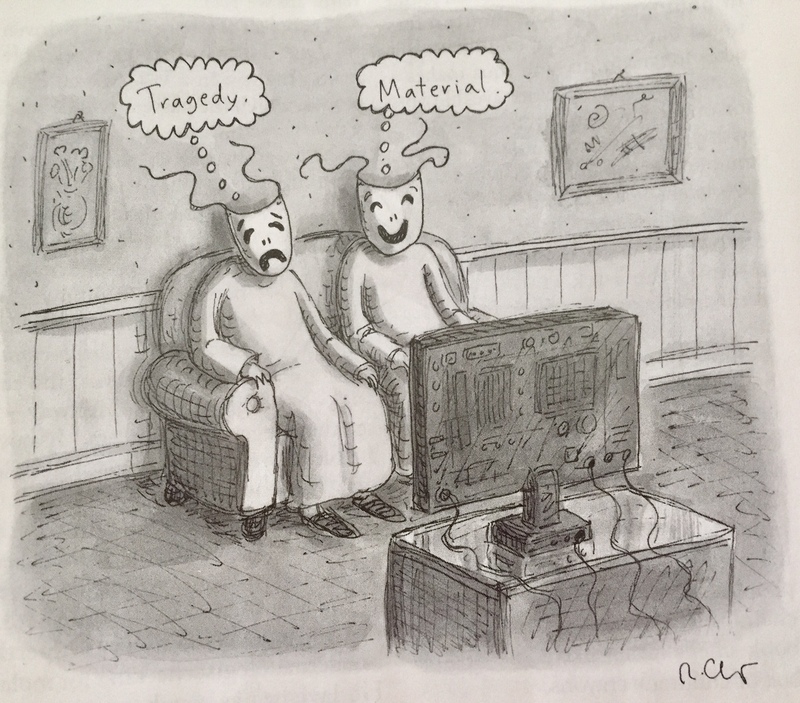 By the way, the New Yorker cartoon is classic! Are we sentimental, nostalgic, or keepers of our legacy? Maybe all three! I don’t remember the last time I received a postcard. I’m impressed you got two and in the same week. Wow, what a blessing! Not surprising though as you have a large fan club along with a host of friends and relatives behind the scene we never meet. Our home made it through the vicious storm unscathed although two pines fell over on our rental problem, one damaging the garage. Our church is gathering “buckets” of cleaning products to help those in our community who didn’t fare as well. That’s how we roll. Thanks, Jill! So glad you found a buyer for your Aunt Ruthie’s house. The closing on the house we are currently living in is tomorrow and we both happy and sad about having to say goodbye to such a wonderful home. But we’ll rent back for the buyer so that we can take our time moving which will happen in mid-November. Congratulations on the house sale and to the moving on, all of which is bittersweet. You know I understand this sort of transition: the physical stress of transferring possessions from one place to another and the feeling of disequilibrium at times. Yet, I know you and Bill believe this is the right thing to do now. I’m not surprised that your house sold so quickly, beautiful inside and out. So glad the roof caving in wasn’t a problem! 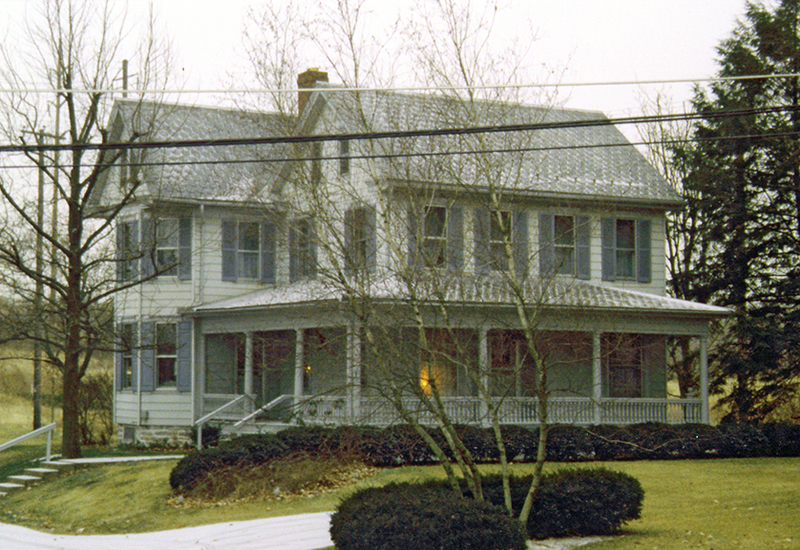 Yes – the buyers had seen the house when it was intact. When they returned (I believe from some where in Europe) they still wanted the property. What a blessing! Thanks so much for stopping by today, Fiona. So pleased the house was bought by a young couple. It sounds like the house has found a good home!! or rather good home owners who will continue to fill it with more happy memories. I can just imagine how you felt when the ceiling fell. 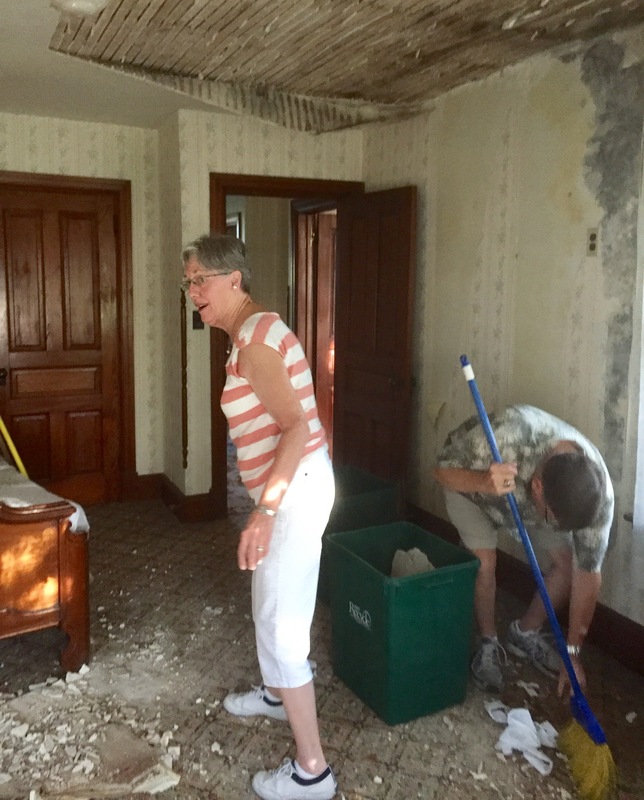 We didn’t see the ceiling fall, but we had to deal with the aftermath. Yes, I’m sure you can imagine the upheaval. As an accomplished fiction writer you could definitely recreate such a scene. I hope your most recent book tour was a resounding success, Darlene. Marian, I’m sure now you can look back and laugh about that morning even though at the time it appeared to be a tragedy. Every cloud has a silver lining, and I’m so glad the buyers were not deterred. Your stories are charming and always so well written. I do love them! Laughing in the Finger Lakes. First the shriek. And then the hard work. What a challenging moment for that surprise. I’m glad you had helpers. 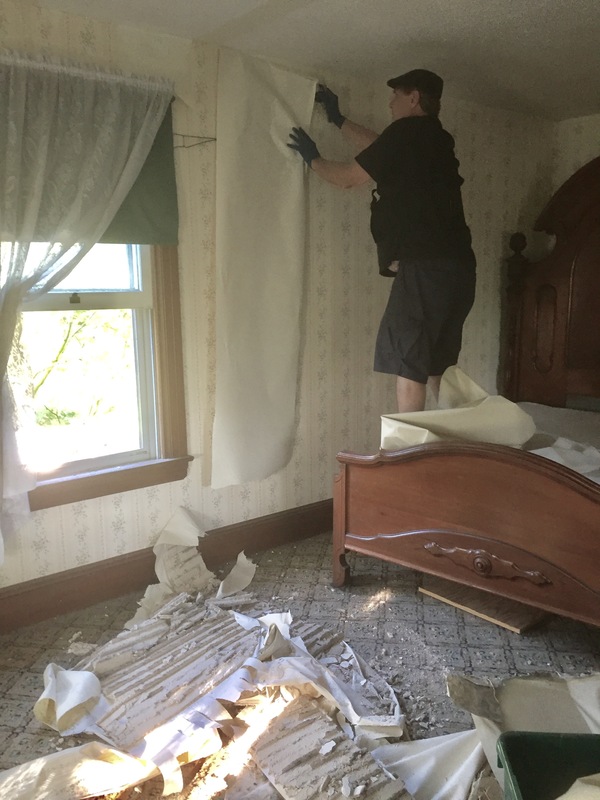 In the 1970s, we routinely tore out plaster walls and ceilings in my old house, one room at a time. Filthy, dusty, face mask work but necessary to open the walls so Vic could build corner bracing and structural support for windows. We also had to keep the place from swaying in the wind. So, one room at a time, seeming endless, but it did end, we rebuilt the old dump and created a beautiful home, sound right down to her bones. What a beautiful old home that couple bought. Sounds like they have the energy for it. Lovely photos plus a joke that any writer understands. Your home has beautiful bones. I’ve seen the sturdy exterior and a few glimpses of the interior, often with Willow. One day you too will pass on the homestead to the next generation. After all the unremitting labor (no joke!) until the day of the sale, we thought we were home free, our work ended. For about 5 seconds after beholding the disaster I truly lived the expression “I couldn’t believe my eyes!” My first thought was “What a dirty trick. Why did we have to have a downpour the night before the sale?” Later I became more philosophical, metaphorical. Maybe the house missed its friendly furniture and family photos populating the walls and simply rebelled. Nah! As you mentioned earlier, I too marvel at how blog posts develop with the writer’s Part A, and then the conversation that follows with replies (Part B), rippling beyond the borders. Your comments are always rich, Elaine, especially that I know the farm, Virginia, your writing, and who knows what else demand your attention. Thanks again! What a cartastrophe! All ended well though, and the house was sold. Interesting story, brilliantly told as usual. You have a gift, Marian! Lovely to see you’re using it writing your memoirs. I’ve just published my mum’s autobiography. Yippee for you, Carole, the keeper of the memory flame. We are both preserving a legacy that may otherwise be lost. It’s nice hearing from you again! I love the way you respond to everyone!